Claude Dozorme produces some of the finest cutlery and tableware in France. Founded in the 19th century, it has become a specialist in handmade Laguiole cutlery and tableware. This is a true artisanal company where all the pieces are of the highest quality. The company offers a wide range of service sets, including carving sets, salad service, foie gras and smoked salmon service sets, cheese knives, bread knives, and sets of steak knives. Claude Dozorme is also famous for offering a very extensive range of handles and a choice of solid brass or stainless steel bolsters. All items come in beechwood presentation boxes and make the perfect gift or promotional product for important accounts. Below you will find images of the types of handle material the company offers and a selection of their product line, which includes many more items. All come in the handle of your choice. Personalization of the boxes and the blades is available. synthetic mother of pearl handle. No. 260 058, two piece stainless steel salad service. No. 260 001, six piece steak knife set with Ivorine handles. No. 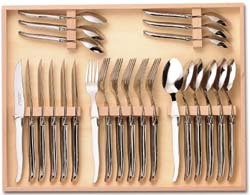 260 013, 24 piece tableware set with stainless steel handles. No. 260 016, two piece foie gras service with clear natural horn handles. No. 260 023, cheese cutting & service knife, clear natural horn handle.